Nigeria’s immediate past President Goodluck Jonathan has recalled his very final moments as the number one citizen of the country. Speaking in his new book, “My Transition Hours”, the former President recalled how he ended up at the Eagle Square as a common citizen after handing over to his successor, Muhammadu Buhari on May 29, 2015. 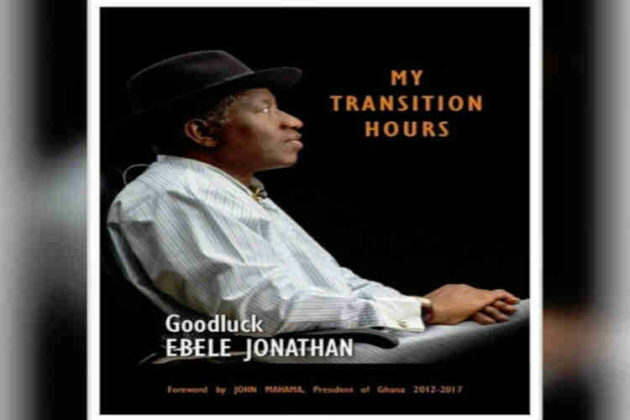 CKN News reports that the former president launched a book on Tuesday titled ‘My Transition Hours’, in which he wrote about issues concerning his administration. Jonathan also explained why his wife, Dame Patience Jonathan, was not with him at the Eagles Square during the ceremonial handing over. The former President revealed that: “The morning of Friday, May 29, 2015, began very early. It was the D-Day for the inauguration of the President billed to commence at 10.00 AM. “The event expected to be witnessed by no less than 20 world leaders, was being held at the Eagle Square, Abuja. The day was certainly going to be interesting and I felt ready for whatever emotion came my way. “Today, after the oath-taking ceremony, I would finally be going home! “This was an event I had chosen to undertake alone so my wife did not accompany me. Dressed in a black woko, my traditional attire and my signature fedora hat, I walked out into the beautiful sunshine and got into my official car. “The members of staff of the Presidential Villa, including cleaners, cooks, washermen, security men and more, were gathered outside the Glass House, which had become my official residence after I ordered the main residence to be renovated for the incoming President. “I bade them farewell and with tearful eyes, they waved at me and in unison chorused, ‘bye bye Sir’. I entered my car and the convoy moved. I was missing them already. These were very hard-working Nigerians of diverse tribes and tongues who had served their president well. “Azibaola Robert, my cousin, had come that morning to move my personal effects to the car alongside Waripamowei Dudafa and some of my immediate security aides. Before I left the State House for the Eagle Square, I had inspected the last guard of honour mounted by the Brigade of Guards at the inner gate of my residence. “It was symbolic because it would be the last inspection of the State House Guard of Honour. “My thoughts reverted to the official swearing-in ceremony that I would be participating shortly. The convoy came to a stop at Eagle Square and I exited the car. I went on to greet a few people and was thereafter ushered up the platform where I was to receive the national salute. “Next on the programme, the commander sought my permission for the parade to begin. After giving the permission I went to take my seat next to the President-elect, Muhammadu Buhari, and his wife, Aisha and my vice president, Arch. Nnamadi Sambo. “After President Buhari had taken his oath of office, it was time for me to leave. I waved at the crowd. To my surprise, I noticed some of the attendees had misty eyes. This struck me because I believe almost all of them were either members of President Buhari’s party, relatives or friends. “I was now like any other citizen of the Federal Republic, boarding my personal vehicle to be driven to the Abuja International Airport for the final part of the farewell ceremony in honour of an outgoing President. “She did not have to ask; she knew what I had just been through. She touched my hand gently and together we boarded the flight that would take us to Port Harcourt International Airport.